Apologies for the lack of posts of late but as some of you might know, I’m in the process of moving back to the UK from France so it’s all been a bit hectic recently. This is the first thing I do before I even think of pulling anything out to pack and I do this whether I’m going for a weekend away or a 2 week long holiday. I’ll be the first to hold my hands up and say that I just cannot travel light. I don’t know what it is but I will never be one of those people who can go on a week-long holiday with just hand luggage. But I have come to realise that when I make a list, not only do I manage to streamline my items but it also makes the following process a lot less stressful. I start by thinking of what the weather is going to be like in the chosen destination and what activities I’m going to be doing on said trip then look at what clothing items match these; will it be cold, is it going to rain, are we beaching/shopping/hiking?? I then work out how many outfits I’ll need per day and whether some items from these outfits can be recycled i.e. do I really need 4 pairs of jeans or will 1 suffice? Am I going to wear those super high, super uncomfortable heels or will I end up living in my sandals? This helps me to figure out things I really don’t need and therefore, lighten the load. I then add on to my list things like “make up” and “phone charger/camera charger/anything else electrical” as more of a blanket term just to ensure I don’t forget them. I find this to be a love-or-hate it kind of thing. Some people think this is a great idea, some people find it takes up more room. In one of my smaller, hand-luggage sized cases I have a separate zipped area for clothes so in that instance I will fold them as rolling just won’t work. However, if i’m going on a bigger trip and am therefore taking a bigger suitcase, I’ll usually roll the clothes. The fact is, rolling clothes will reduce the amount of creases in them which is especially great if you need to pack a few days ahead of travelling and have a long trip ahead of you. I also find that I can then squeeze a few more lightweight items in here and there as you have more nooks and crannies (is this making any sense at all?!). This might be something you have to try out for yourself but I promise it works! Shoes are a bit of a bugger. More often than not, they’re clumpy and cumbersome and take up way more room than you’d hoped. In addition to this, they also have potential to get squashed and lose their shape. So I stuff ’em. With my pants and socks (and bikinis if I’m lucky enough to need them!). You’re putting to use the extra space inside the shoe and not taking valuable space in the rest of your case and it also helps the shoes hold their shape! Win, win. Ok, so this one is kind of the same as the above but I also use the extra free space inside my handbags to store my plugs/adaptors/chargers and jewellery. It saves them from getting tangled with other items along the way (I also tie hair bobbles around any cables for this and it also means you have a spare hair bobble should you need one) and protects any valuable jewellery from getting damaged. I’m a bit obsessed with a good old ziplock. We all hate the ones they provide at the airport for your liquids (even when the ziplock you have put them in yourself is sturdier than theirs, they still insist you change it?!) but when it comes to packing, they’re amazing. I use them to store my shoes in to protect my clothes from their dirty soles, I use them for liquids I think may have potential to explode and I always keep a large spare one in my case to house any worn underwear/clothes. You can of course buy really pretty dust bags for your shoes and bags and the same goes for your toiletries but this saves you spending much money and you’re also able to see what’s in each bag without having to open them up. I used to think the sample sachets you’d get given alongside other purchases were just a bit of a waste and that I’d never use them. How wrong I was. I save these up now especially for when I’m travelling as it saves bringing along my 250ml bottle of everything and saves having to buy those smaller miniature-sized bottles of your favourite products that usually aren’t that cheap overall. It’s also a nice way to put a few new products to the test throughout your holiday; although yes, this can be a bit risky… err on the side of caution as you don’t want to break out in to a full on face rash on your long-awaited trip away – we all want to look our best in our look-at-me-I’m-on-holiday Instagram snaps, don’t we?! 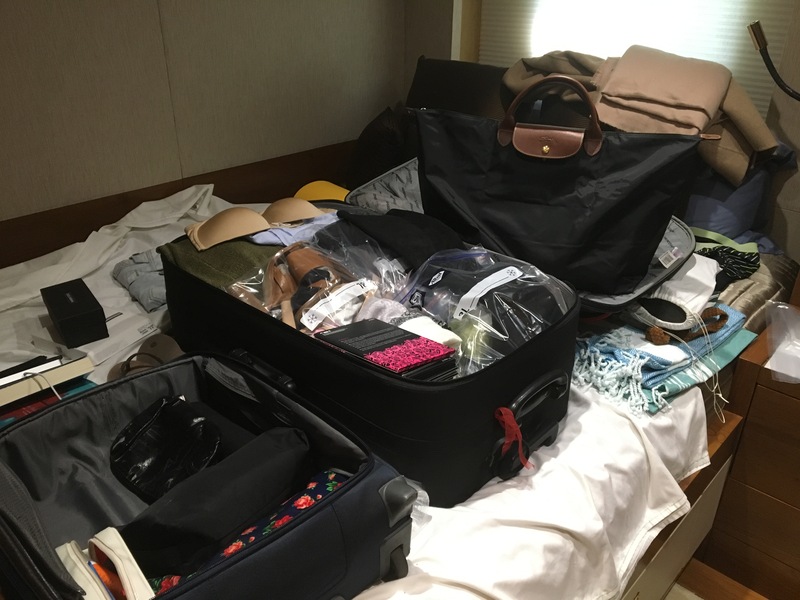 I hope at least one of these tips may come in handy for you when it comes to packing for your next trip… I’m off to finish stuffing my many, many suitcases for the long old journey back to England! Follow my blog with Bloglovin or hit the follow button down below for more HeatherH updates!